As Director of Instruction for the School District of South Milwaukee, I can share our district experienced similar wonders and curiosities about whether or not we were ready. What might high-quality professional development look like based on educator choice? How might competency-based professional development directly impact student and staff success? How might we implement such a different model of professional development than our current structure? To further explain the journey, our three key steps were engage, embark, and embrace the process. Making the decision to dive into a different model for professional development meant we needed to engage in conversations about our desired outcome, the ideal path to our destination and for what ultimate purpose. In simple terms, we need to know what we wanted high quality, personalized competency-based professional development to look like, how we were going to arrive and why. The why was the easiest question to answer initially. We had heard from staff that not all professional development meets everyone’s needs in the same way and to the same degree. Therefore, why engage in micro-credentials? because self-selection allows staff to determine a “just right fit” for the needs of their students and themselves. Second, we wanted high quality, personalized competency-based professional development to be appropriate for a wide variety of staff and in a timeline that honored working professionals to dedicate and commit time how they best saw fit. Finally, the ideal path for us was carved by creating a pilot team to help identify what educators wanted and needed. Our team valued the importance of having the freedom to make individual choices within the parameters of what the district leaders believed matched the culture of learning. Staff ultimately chose 14 micro-credentials among a selection of over 100 options. Setting the ideal conditions was vitally important. The first step in determining cultural readiness of a change in professional development is engaging in the conversation by asking the right questions with the right people around the table. Once the decision has been made to engage in competency-based professional development, the next step is to embark on the journey of discovery and reflection. Following a clearly identified plan as part of the engaging stage, our district walked side-by-side with the educators involved in the pilot to learn together about the journey. We unpacked a common micro-credential in order to reveal individual and systemic obstacles and opportunities prior to the gradual release of responsibility to the individual educators. We navigated the platform and discussed enhancements and improvements. Then we supported each educator in personalizing his or her own pathway while also coming together periodically as a team to serve as a common thread, connecting folks with common interests and needs. We met in both synchronistic and asynchronistic settings to reflect on our journey and make necessary revisions along the way. A key to our success of cultural readiness was to return to the engage step and review our outcome, pathway and purpose. This allowed our team to feel the cultural confidence to continue to embark on the journey. Change looks different. As oxymoronic as the statement might seem, we needed to embrace the understanding that our change in personalized professional development around a competency-based model meant we needed to embrace the similarities and differences this opportunity afforded us. The biggest shift was accepting and embracing the mindset of competency-based evidence of educator and student growth. Not all educators were able to provide evidence of approved competency with the submission of the evidence the first time. Educators believe in a growth-mindset for students and the notion revisions and drafts. Yet, we discovered that it was difficult to accept that same concept as educators; we too are in a learning phase. Reality set in for many that providing sufficient evidence of successful “competence” for all aspects of the micro-credential the first time around might not happen. The phrase that haunted several in the early stages was “submission denied.” Nonetheless, we worked as a team to embrace the phrase and understand that “submission denied” does not mean “you failed as an educator.” Quite the contrary! We learned to embrace the phrase to mean, the evidence that was provided did not demonstrate competency in the given area which then affords the opportunity to think about how the educator might rethink or rework an aspect to demonstrate deeper understanding. Ah! Deeper understanding; we can all embrace that! Lastly, we learned to embrace the ambiguity and personalized nature of personalized competency-based professional development. The beauty of this type of professional development is the pathways for excellence for our educators are endless. The journey truly resides in the path the educator chooses to take and the ways in which the educators decides to showcase understanding. Embracing the nebulous notion of personalized success is not typical to the culture of education, at least from the standpoint for many current educators. We come from a land of predetermined outcomes, paths, and credentials that have been determined for us by someone else unaware of own individual needs and interests. Yet, this is the very reason to engage, embark, and embrace the journey. Our journey has been most rewarding in that our educators have walked in a land of personalized professional development that honors and acknowledges efficacy and excellence in education. Students and staff are the recipients of benefits beyond the recognition of “submission approved.” This journey allows all learns to experience growth, understanding, and acclaimed competence. Are you ready to engage, embark, and embrace on the journey? 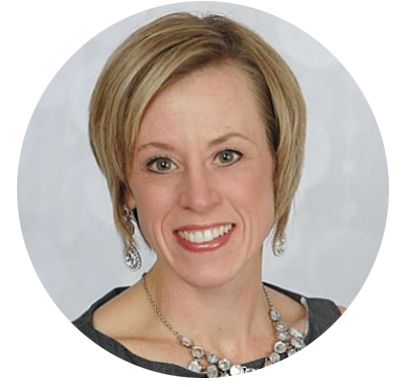 Why are you interested in competency-based professional development? What do you want high quality, personalized competency-based professional development to look like? What steps do you need to take to ensure everyone know how you are going to arrive? How will you support those embarking on the process? How will you address obstacles and opportunities? I’m curious to hear more about your thoughts and your journey. I encourage you to share your stories and reflections with me at aecker[at]sdsm.k12.wi.us or via Twitter @eckera7077. 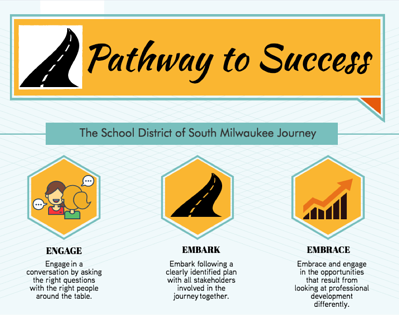 Learn more about how the School District of South Milwaukee is embracing personalized, competency-based professional learning.